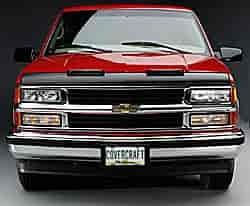 Covercraft Mini-Masks protect the area of the hood that takes the most abuse. Can be used in any weather. Easy to install, with no tools or hardware required. Hood opens, allowing easy engine access. Air foils are used to prevent flapping. Deflector-Protector® is a hood mask with built-in bug deflector. It can be removed in minutes for storage, and installs quickly with a hood strap, so no drilling or hardware to attach!